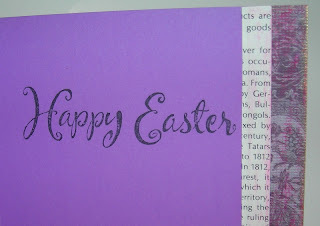 Thought I'd pop in here & wish EVERYONE a "HAPPY EASTER!" 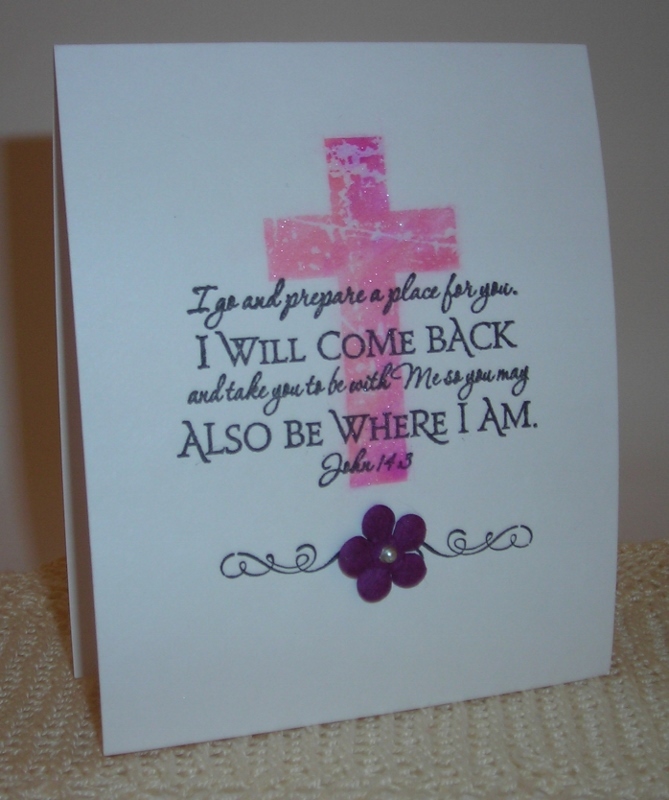 "I go & prepare a place for you. I will come back & take you to be with Me so you may also be where I am." John 14:3. This is our HOPE as Christians! NOTHING that happens to us can take this BLESSED HOPE from us! For we serve a God that KEEPS HIS WORD! 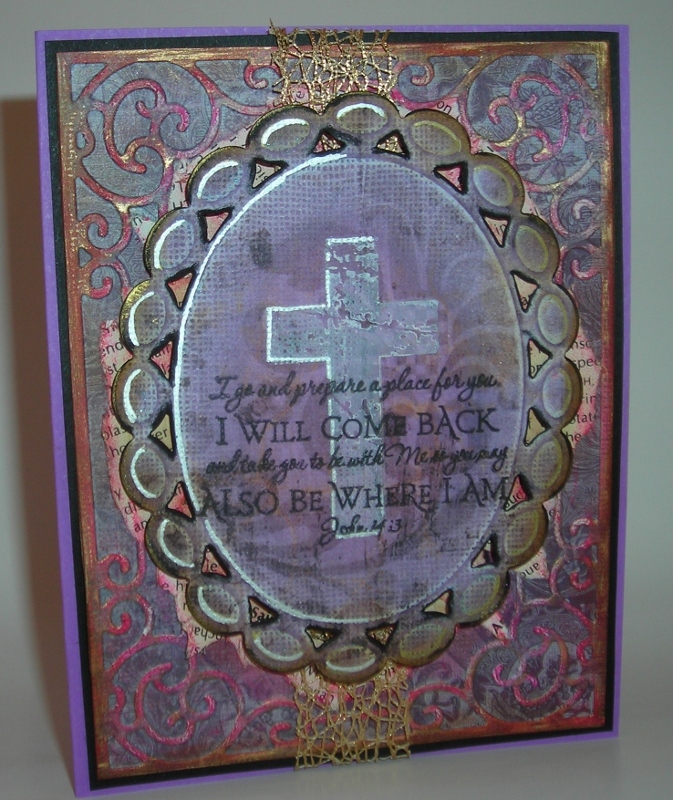 This card was made with: Memento Black Ink, CHF Modern Cross, ODB Scripture Collection 2, VersaMark & Pebbles Chalks, Swirl- SU Abundant Hope, Prima-flower, Liquid Pearls-Silver. Well, I HAVE TO TELL YOU!!!!!!! I AM A HAPPY CRAFTER after winning some GELATOS....! I have been playing with my GELATOS & other Faber Castell goodies & I am IN HEAVEN!!!!!!! AND I'm NOT DONE YET! 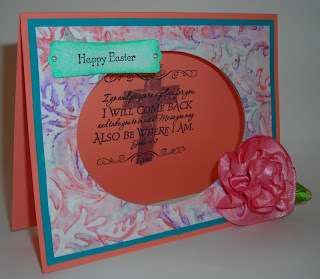 I needed to make my EASTER CARDS so, I went about playing with the Gelatos I had just won! Here's is my first card, I wanted something RICH & AGED! Can you see BEHIND the main image? I used an old encyclopedia & ripped it in pieces & decoupaged it to the embossed card stock, in the center of the Tiffany design. Once it was dry, I rubbed Gelatos, (same color as above) over the edges of the torn papers & rubbed it around with my fingers. I felt I needed a little lighter background just around the main image to make it pop! 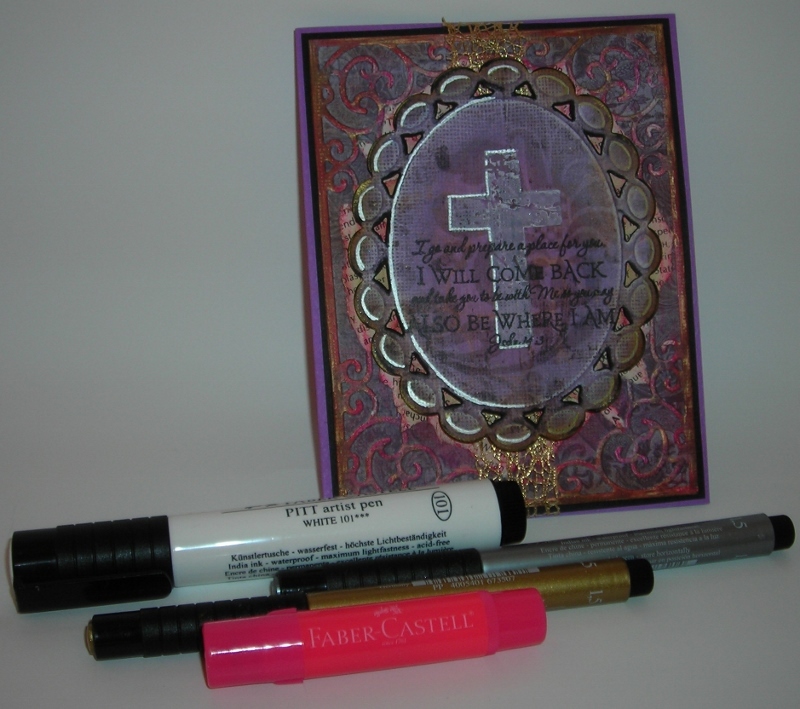 Using the Spellbinders Die- Beaded Oval for the main image, I stamped my image (CHF- Modern Cross) using the Pitt Artist Pen-White! Coloring my stamp with the marker & stamping on the darker designer paper. I also used ODB Scripture Stamp from Scripture Collection 2, using Memento Tuxedo Black Ink. 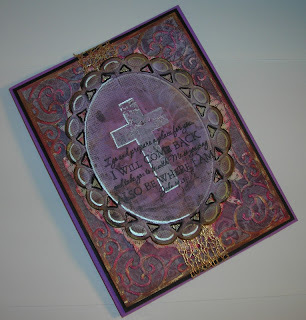 I sanded the Beaded Oval die edges & then used Tim Holtz Tea Stain Dye on the Oval & the Tiffany embossed piece. I then used the Pitt Artist Pens- Silver & Gold! You can see the silver shinning! I used the Silver on half & gold on the other half. 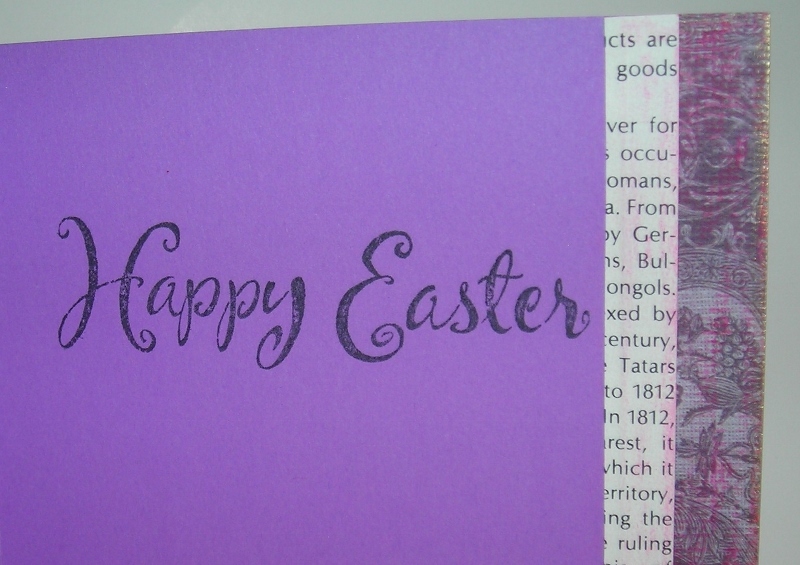 Inside: I used stripes of paper to embellish from the DCWV piece I chose & the encyclopedia paper. 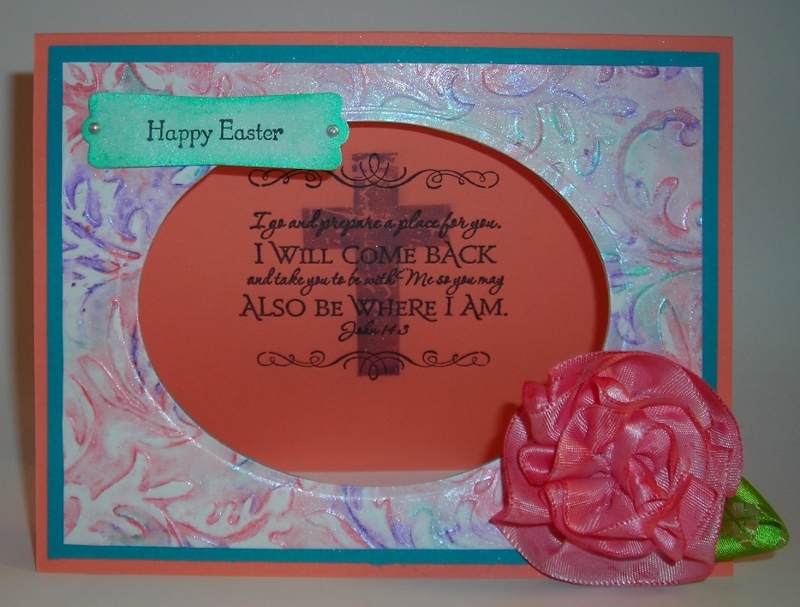 I edged the outer piece with the Pitt Gold Pen & also rubbed some Bubblegum Gelatos over these pieces. The inside sentiment is by Inkadinkado. Here are the Faber Castell goodies to look for in the store! NEXT, I wanted to try going pastel! So, I made another card using a different technique! This time I colored the Cuddlebug Folder- Victoria with the Gelatos! ( Metallic Mint, Metallic Grape, Metallic Melon) A little here, a little there kind of thing! THAT was FUN & spritzed it with water & ran it through the Big Shot! I LOOOOOOOVE the effect! Take a look! Isn't that SWIRL of SHIMMERING COLOR GORGEOUS!?! For the "window" I used Spellbinders Classic Oval. 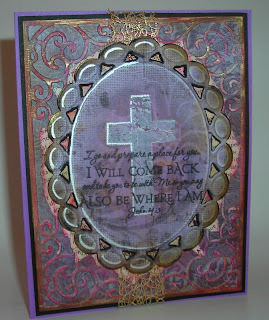 I used the Gelatos ( Metallic Grape) to color my stamp image, CHF- Modern Cross & then spritzed the stamp with water & then stamped! 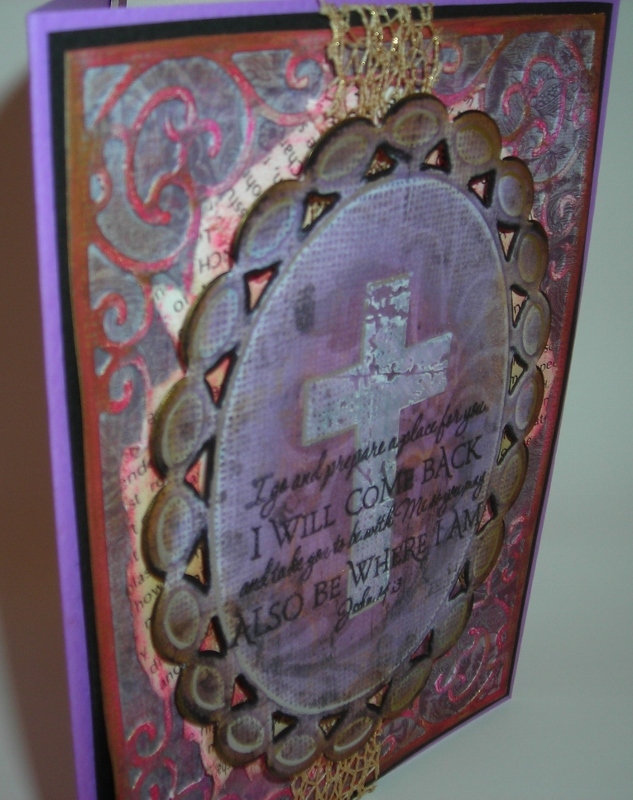 I stamped the Scripture- ODB- Scripture Selection 2 with Memento Tuxedo Black Ink. 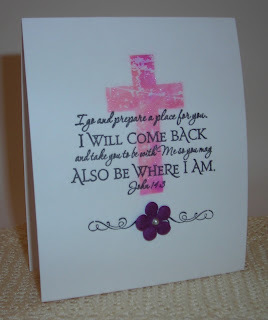 The little Swirlys over & under the cross & scripture are from SU- Abundant Hope, the outer sentiment or "Happy Easter" are from SU- Teeny Tiny Wishes & the punch is SU- Modern Label. 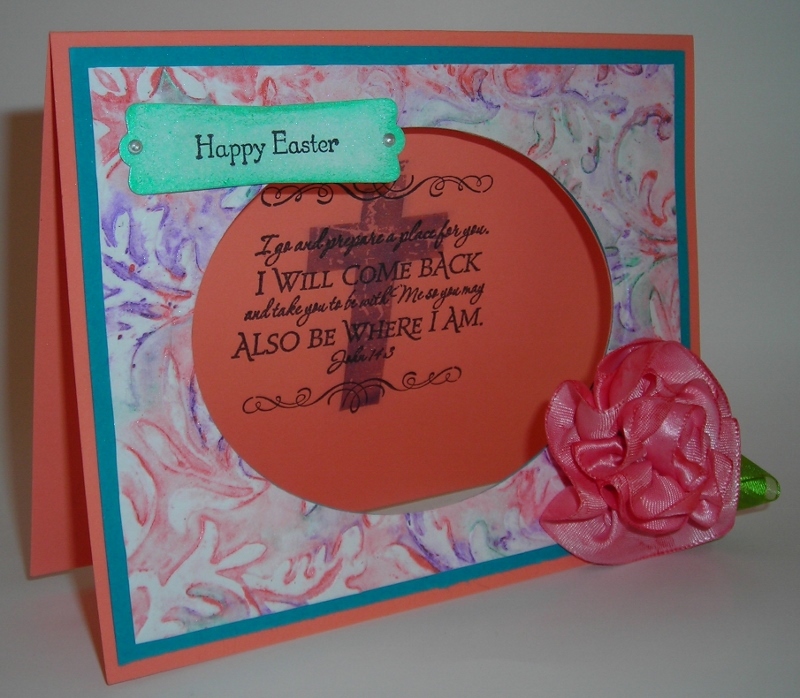 For the label, I colored it with Gelatos ( Metallic Mint) & wet it with my fingers, let it dry, stamped it, & punched it out. I also used Silver Liquid Pearls on either end. ANOTHER FUN THING TO DO WITH GELATOS! I used Gelatos on my ribbon flowers! Just take the little tube of SCRUMPTIOUS COLOR & rub it where you want it on the ribbon & then dipping my fingers into water I blended the color! You can see the variation of colors on the ribbon! I used a yellow ribbon for the flower on the left & colored it with Red Cherry Gelatos. The flower on the right is a pink ribbon colored with Red Cherry Gelatos also! Then after I created the flower, I took the gelatos & rubbed just a little extra color on the edges of the flowers. I used the flower on the right, on my card above but, I have a special gift to place the flower on the left on! 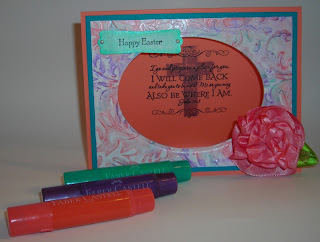 I am planning a little trip to a CRAFT STORE that is coming to our area! (REMEMBER, I've told you, there are NO CRAFT STORES NEAR where I live!) SO, I am QUITE EXCITED!!!!! I need CERTAIN COLORS OF GELATOS to complete my next project! AND I THINK this "new" craft store even carries FABER-CASTELL PRODUCTS!!!!!!!!!! TALK ABOUT A HAPPY CRAFTER!!!!!!! Now, let me tell you about what's going on over at JustRite Stamps AND who they've teamed up with! Can you guess??? That's right, FABER CASTELL! Do go over & take a look & see what you could WIN!!!!!!!! BELIEVE ME, these products are WORTH IT!!!!!! TODAY, is day TWO! So, if you check it out NOW, you may have the chance to win some FABULOUS PRIZES!!!!!!!!!! FINGERS CROSSED & WISHING YOU WIN TOO!